Hwal`bay means “People of the Tall Pine.” The Hualapai live on a reservation encompassing a million acres along 108 miles of the Colorado River and the Grand Canyon. The Hwal`bay call this middle river corridor “Hakataya” or “the backbone of the river”. The Colorado River is a significant landmark for the Hualapai. Historically, all of the Yuman language family tribes were located on or near or in close proximity to the Colorado River. There is a common binding creation myth which took place at “Spirit Mountain,” or “Wikahme”, along the Colorado River near Bullhead City, Arizona. The Hualapai are descendants from one people, a group known archaeologically as the Cerbat. The Hwal`bay originally lived in groups composed of fourteen bands. Culturally, the Hualapai consider themselves as part of the “Pai” meaning “the people.” The earliest physical remains of the Pai was found along the Willow Beach bank near the Hoover Dam in the 1960′s and dates back as early as A.D. 600. The Grand Canyon always provided important food sources for eating, for medicinal uses, and for utilitarian purposes. The major wild foods are derived from cactus fruit and from the seeds of various grasses and with the use of metates and mano stones. An Executive Order created the reservation in 1883. Peach Springs, the tribal capital, is 50 miles east of Kingman on Historic Route 66, owes its name to peach trees growing at springs nearby. Occupying part of three northern Arizona counties, Coconino, Yavapai and Mohave, the reservation’s topography varies from rolling grassland to forest and the rugged canyons of the Colorado River. Elevations range from 1,500 feet at the Colorado River, to over 7,300 feet at the highest point of the Aubrey Cliffs, which are located on the eastern portion of the reservation. 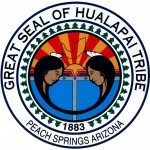 The total population of the Hualapai Tribe is 1,532 and the median age is 23.6 (1990 U.S. Census). Tribal, public school, state and federal governmental services provide the bulk of current full-time employment. The principal economic activities are tourism based, cattle ranching, timber sales, and arts and crafts. The Hualapai Reservation area offers hunting, fishing, hiking and camping facilities. An outdoorman’s paradise, Hualapai Wildlife Conservation sells big-game hunting permits for Desert Bighorn sheep, trophy elk, antelope and mountain lion. The Colorado River bounds the northern edge of the Reservation. The Hualapai River Runners, the only Indian-owned and operated river rafting company on the river and a tribal enterprise, offers one and two-day trips. Offering an alternative to the congested National Park, Grand Canyon West attracts more than 3,000 guests each month. Lake Mead National Recreation area lies to the west of the reservation. Hualapai Folk Arts also offers a variety of traditional and modern art for sale.